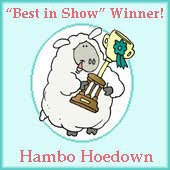 Today I did a card for Sassy Studio Designs and their sponsor this week is Tuesday Morning Sketches http://tuesdaymorningsketches.blogspot.com. 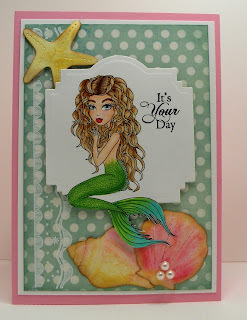 I love this mermaid by Sassy Studio Designs and thought I would try to do a card with her using some shells that I cut using old Sizzex dies. Well they didn't come out so well but I love how the coloring came out on the mermaid. I think what I love most about these images is the detail they have in their hair. It is so fun to try to get the waves and dimension of it. The second thing I have discovered is I like to color different types of skin colors and how to shade them. It presents a real challenge to me. While I was at the Copic Certification class Marianne Walker showed us how to blend colors so I did this on her tail and fin, going from green to a blue. I did it at her waist too. What a very colorful mermaid. Love your interpretation of the sketch. Thanks for sharing with us at Tuesday Morning Sketches. Really gorgeous! I love how the sea elements are corner pieces. Great job. Thanks for joining us at Tuesday Morning Sketches. This is absolutely gorgeous!! Beautifully colored. Thanks for joining us this week at Tuesday Morning Sketches. Gloria, this is amazing. Love the blended colors on the mermaid scales, looks gorgeous. You've been rocking these SSD creations! Love them all.